Offering two different tours throughout the mountainous metropolis, you are sure to find some delicious snacks along the way! Start Downtown to try 6 different eateries and traverse around the RiNo, Ballpark, and Union Station areas. Don’t have time in the middle of the day? Try the Cocktails + Tastes tour for a curated happy hour unlike any other! Have a private tour in mind? They will work with your group to make a truly unique + deliciously perfect experience. Jessica Baumgart, founder + owner of Delicious Denver Food Tours! I am an avid traveler having been to 35 countries and having worked as a chef + cooking class instructor. I'd been on food tours all over the world and loved the idea of combining my love of food with my passion for showing travelers my amazing city. Food tours are the perfect way to explore a new place - you learn so much about a city through its food scene. 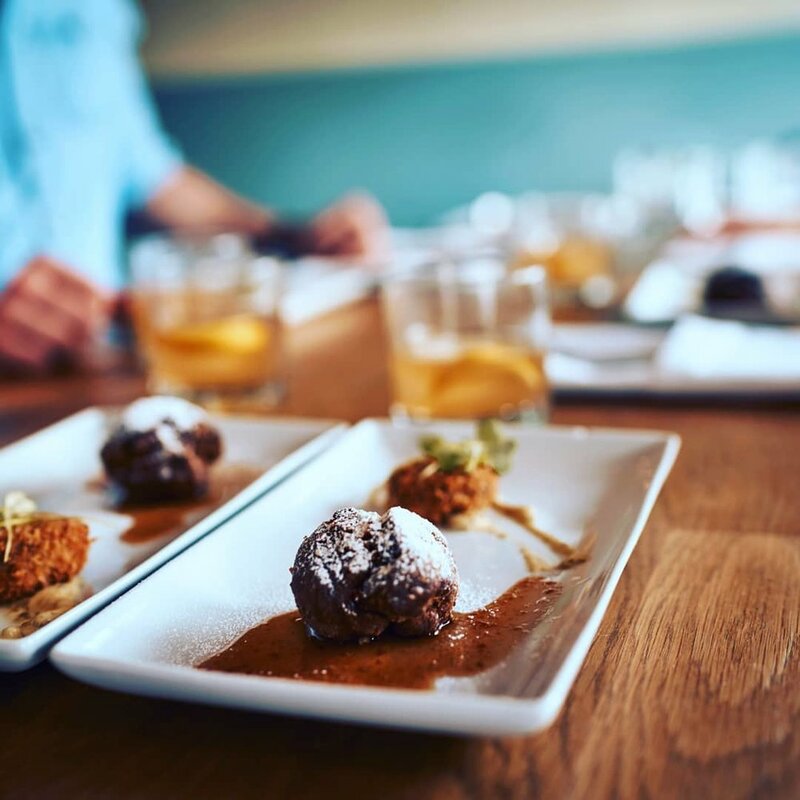 In Denver, we're lucky to have so many talented chefs creating delicious dishes and opening new restaurants daily. My goal is to take travelers off the beaten path and into those great restaurants that only the locals really know about. I'm incredibly proud of our team of food tour guides. Every one of our guides is incredibly passionate about our city and the food scene here. On our team we have chefs, serious home cooks and foodies, and every single one of them loves meeting new people and connecting. I enjoy the connection to the local community - we only work with local businesses which requires us to get to know the people behind the restaurants personally, and having those relationships is very rewarding. I love being a part of Denver's food scene. I've lived and worked in Chicago where the food scene was a little more competitive/cut throat, but here it seems like there's a real sense of community among the locally-owned and operated restaurants. People share ideas and team up to create special dinners and events that give back to the community. I love meeting with chefs, hearing about what they're working on and helping to connect them with a wider audience of guests and foodies. A couple of things! First off, we're locally owned and operated, so I think there's an added level of care and passion for a business that's run by its founder. In that same vein, we partner with locally owned restaurants and work directly with owners and chefs focused on showing off local ingredients. Finally, we're focused on doing one thing really well. A lot of tour companies will offer all sorts of different tours like a history tour, architecture tour, bus tours, etc. We just do food tours. By staying really focused on one area, we can work on doing it really well and providing an excellent experience for our guests. If you had to describe the business in 3 words, what would they be? What is your favorite spot to visit in your city? I'm still in love with Union Station, our train station located in the heart of Denver. Two of our food tour partners are located inside the station, and I often work from the great hall just to be around the energy downtown! What is your favorite food or restaurant to enjoy in your city? Too hard to answer! I love so many local spots, but right now I'm loving Super Mega Bien, a Latin-inspired dim sum spot that just opened a few months ago. What is your favorite spot in the U.S to travel to and why? My family has been vacationing on Kiawah Island off South Carolina since I was young. I love biking to the market, collecting shells on the beach and seeing the stars at night. And we can always pop into Charleston for some really delicious fresh seafood! Which of the five senses do you appreciate the most when you travel and why? Taste. That's easy! My husband and I are lucky to share a love for food, so that's always our main focus when we travel. We spent two months working at a cooking school in Italy together. In Tokyo, we would wake up before dawn every morning to have breakfast at the Tsukiji Fish Market. In South Africa, we visited vineyards and ate exotic meats. In Cambodia, we took a food tour through the night markets where we tried every kind of bug you can imagine. I think you learn so much about a place through food, as it brings together a community of people and usually sheds light on the history of the place as well. I'll take a great meal over a museum any day. Do you have a travel memory that is important to you? If so, please share. In Bolivia, my husband and I traveled with a small tour company to the salt flats. After days of riding in Jeeps over vast salt pans and desert, we came to this outpost where we stayed the night in the middle of nowhere. There was a natural hot spring, and it was about 30 degrees outside because we were at such high elevation. We snuck out at night with the other travelers and all got in the hot spring together. I could see the milky way and a full sky of stars. Someone brought a bottle of red wine, and we passed it around sipping right from the bottle and talking about travel. That night always stands out as a time that I was fully present and really appreciative of my life. What would the name of your biography be? What is your favorite 90s jam? Duh, Everybody by the Backstreet Boys (WHO ARE COMING TO DENVER IN AUGUST - so excited). Have any questions about Delicious Denver? Let us know in the comments! Ready to learn more + book your own tour? Click below!